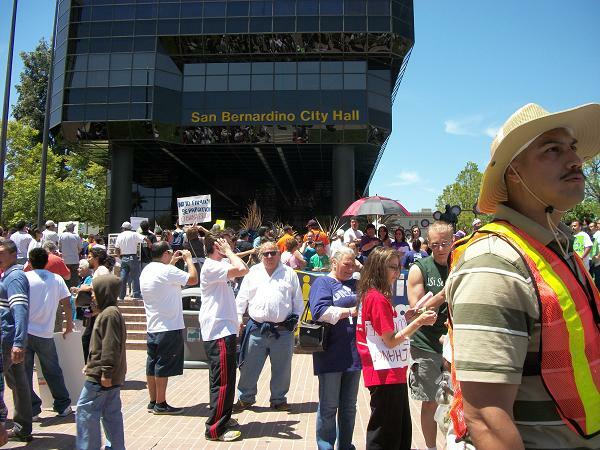 SAN BERNARDINO - Large crowds of people from throughout the Inland Empire gathered in San Bernardino to march for the human rights of immigrants and to denounce the racist Arizona law SB 1070. 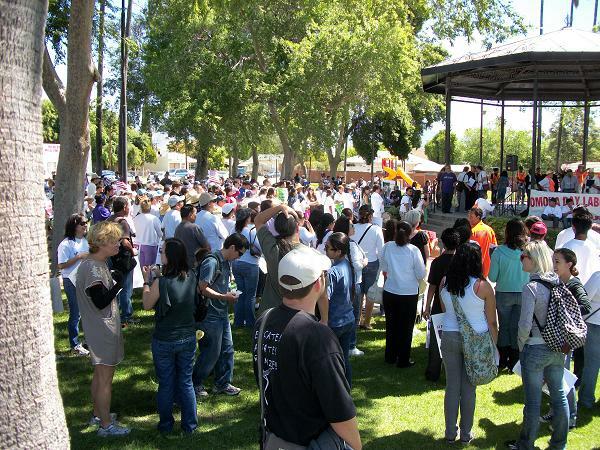 La Plaza Park on San Bernardino's east side was the point of convergence, and music and announcements welcomed the arrivees until about 11, when the ranks began making their way down the sidewalk and across the 215 bridge toward city hall, where a rally was held with music and speeches. Peaceful resistance was the spirit of the day, and careful attention to hydration and mutual respect among attendees was the hallmark of the day's beauty. My morning carpool received an unexpected phone call from Dolores Huerta, then en route to Tucson, who wished us a good march. 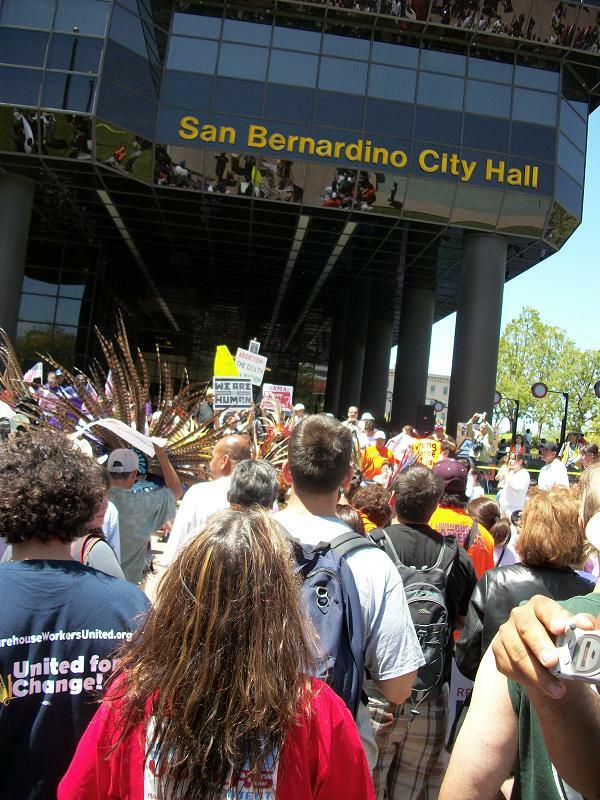 An activist riding alongside her explained that he wouldn't be in San Bernardino due to his participation in Arizona mobilizations. 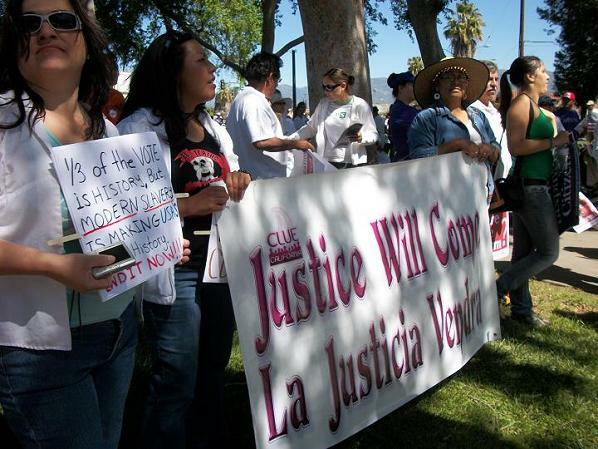 He urged the Inland Empire to keep Arizona in mind and to intensify the struggle through civil disobedience and strategic fasting, if possible. Even though I don't agree with all of her politics, it was an inspiring way to start what a comrade and I later joked is the "high holy day" for activists. 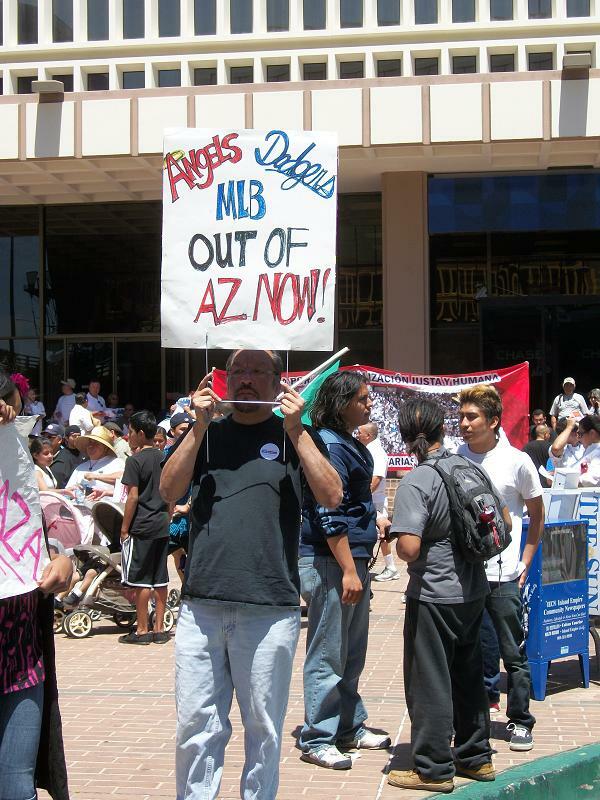 Arizona was close to everyone's heart throughout the day, and although not really reflected in the chants, the concern was expressed in many of the signs and speeches. 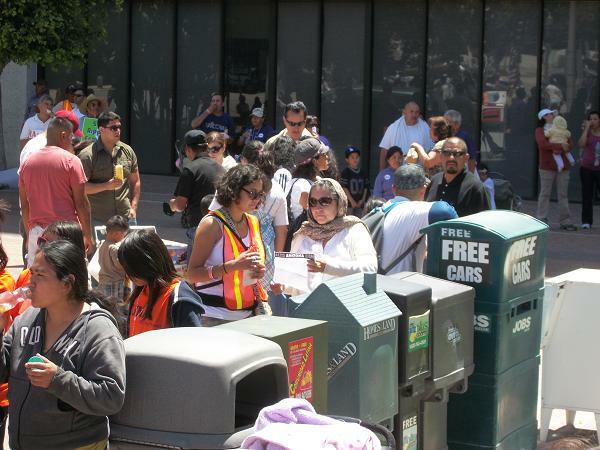 As the carpools arrived, they were welcomed by the people from the neighborhood, some of whom, upon learning of the cause, expressed outrage and compassion for the people of Arizona. A large contingent from SEIU made itself visible by wearing purple shirts, and the Warehouse Workers did the same with their blue, and LiUNA with orange. 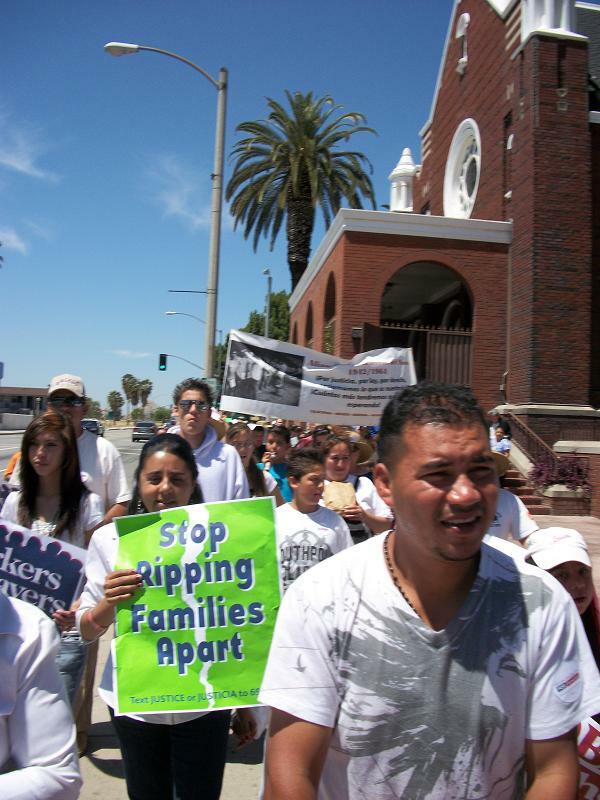 The day laborers and their organizations had a strong presence, as did the faith communities and the students. 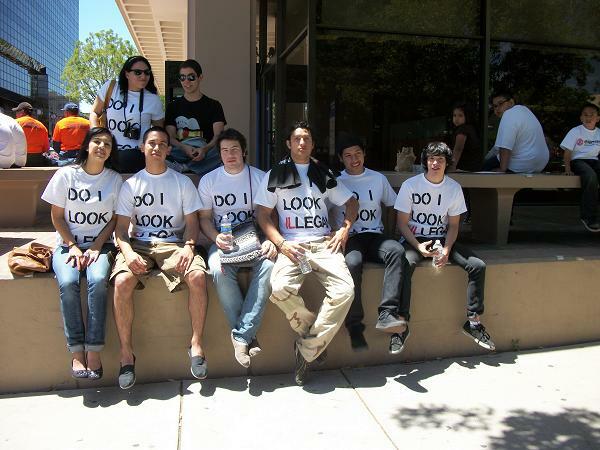 I think I saw students from every local university and community college. But there were are also a lot of young families with children. There were also numerous candidates. 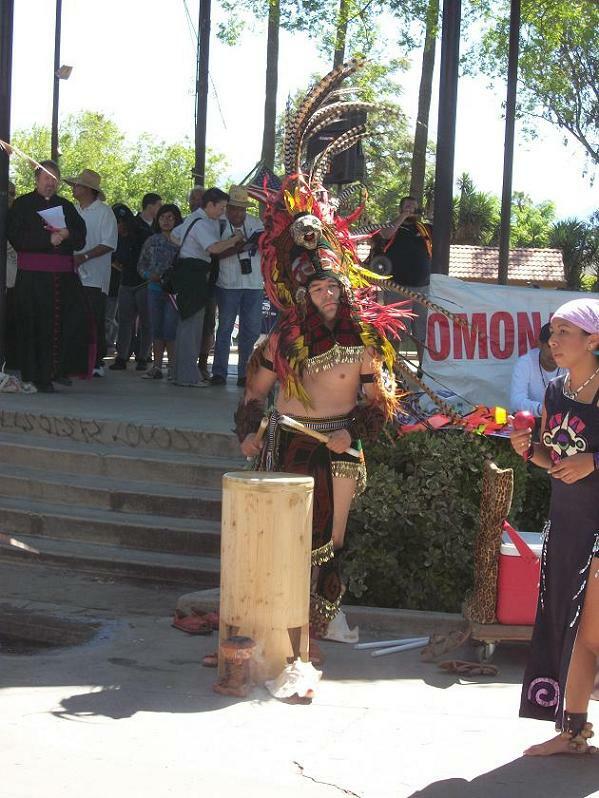 The program began with a ceremonia by Danza Azteca de Aztl�n, which was followed by prayers from different denominations. 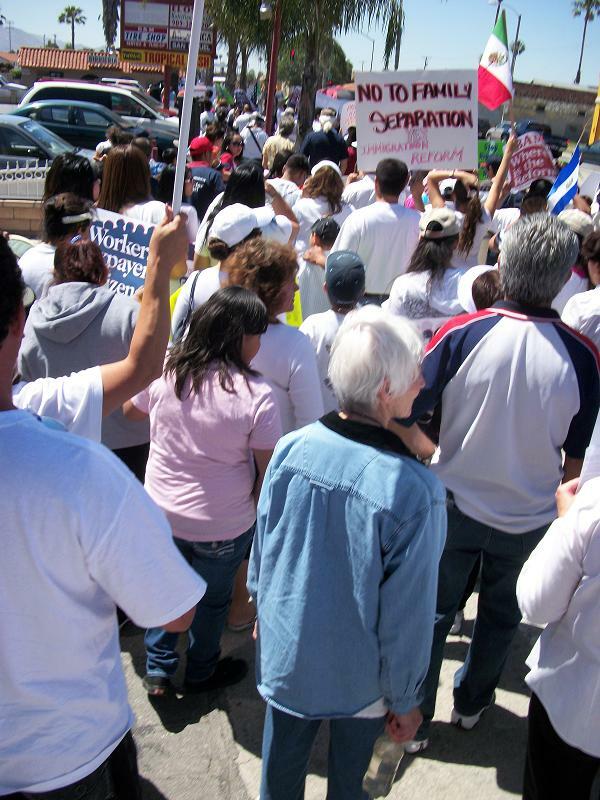 Then the security guidelines were set and we were energized by jumping to the chant "�l que no brinca es migra." Then we unrolled our banners and started down the sidewalk. Trained, orange-vested volunteers walked beside us at intervals of about 25 feet. 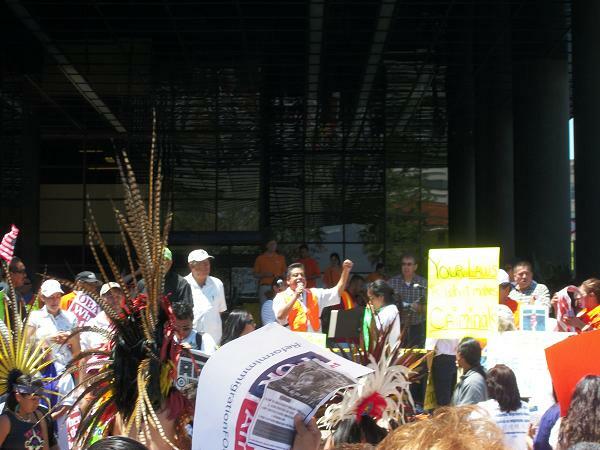 The chants were the normal "S� se puede," "El pueblo unido," and "�Qu� queremos?" As we ascended the bridge over the 215 freeway, the mountains came into view, providing a majestic backdrop. About then someone pointed out that the police were photographing us from within their cars. Someone asked if they were taking pictures, and rather than answering, the officer just waved, even after the question was repeated--a gesture amounting to little more than a taunt. As we passed St. Bernardine's, the elderly people came out onto their balconies to watch us pass by. When we turned on D, I finally saw some opposition. (There had been rumors about some Minutemen hanging in the area but I had not actually seen any). An angry man drove by making a rude gesture at all of us, even though there were children present. But the Minutemen have shown repeatedly with their behavior and their ignorant and vicious letters to the editor, that they and other haters have nothing to offer society. In the end, it will be us, the workers, the people of conscience, students, and families that take responsibility for creating the word we want and need, and we won't have to depend on the upper class who exploit us for our own survival. But I'm getting ahead of myself. As marchers filed into the Civic Center, Son Real delighted us with their renditions of classics such as "The Picket Sign." The danzantes performed again, preceded by an opening prayer, and then speakers from immigrant rights, labor, and student organizations gave their talks. Next the politicians were allowed to talk, Joe Baca in particular seizing the moment for political purposes. 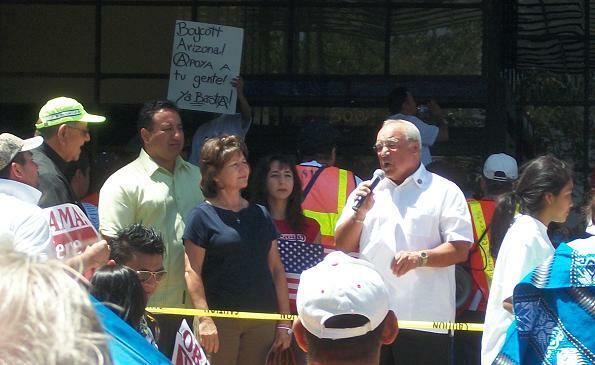 Baca has cultivated the image of a defender of the migrant, but his recent pro-immigrant projects, including the PROUD Act to grant citizenship to high school graduates and his co-sponsorship of the Gutierrez bill, have gone nowhere. 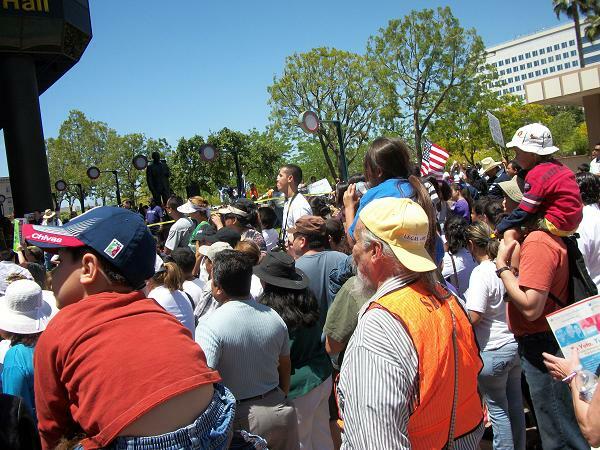 At it's largest point, the rally probably attracted more than a thousand people, all very concerned about Arizona and moved to act by the need for an just immigration reform. As we left, we heard reports of Luis Gutierrez getting arrested in an act of civil disobedience at the White House. If a member of the US congress, a club that tends to attract the most politically tepid, risk-fearing, power-hungry, type of egomaniac, can get arrested for civil disobedience over this fascist law, then what can you or I do? Just before publishing this article I got word that Arizona is planning big activities for May 29, so we may just get our chance to find out. Until then, we should keep up the boycott and most importantly, the resistance in our own communities. This is one unit that was photographing us. Speeches. 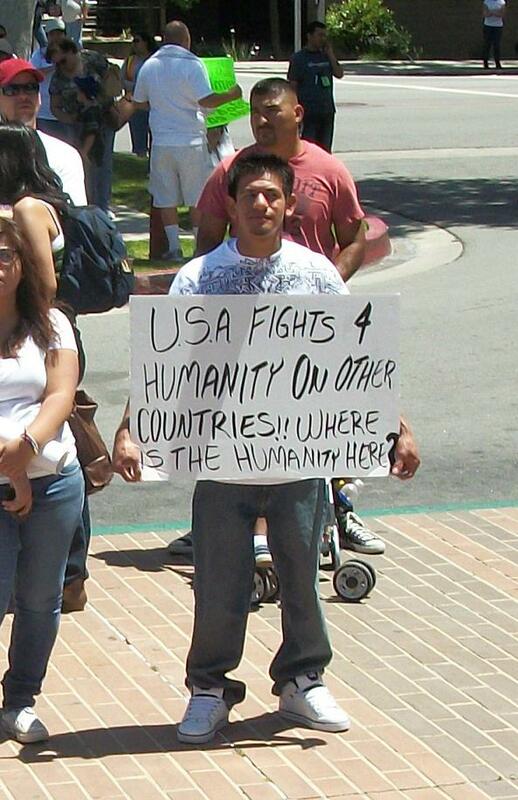 There were two anti-choice people there with big signs, one of which you can see in the background.